The book discusses the full range of tailless designs, from hanggliders to the US 'Stealth Bomber', and includes a detailed look at particularly significant designs. 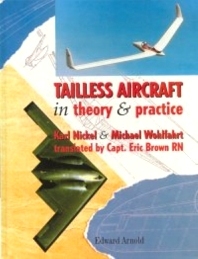 The authors' own experience in this field allows them to explain and illustrate the topic in a way that will both appeal to the enthusiast and satisfy the professional aerodynamicist's need for academic rigour: a rare mix of sound science and first hand experience. University and technical libraries with aeronautical interest; postgraduate and postdoctoral aeronautical researchers; flight enthusiasts for powered flight, gliders, hanggliders, microlights and aeronautical history; designers of model aircrafts. Introduction Aerodynamic basic principles Stability Control Flight characteristics The design of sweptback flying wings: I. Optimisation II. Fundamentals III. Special problems Hanggliders Flying models Fables, misjudgements and prejudices, fairy tales and myths Discussion of representative tailless aircraft Bibliography * Name, aircraft and subject index.